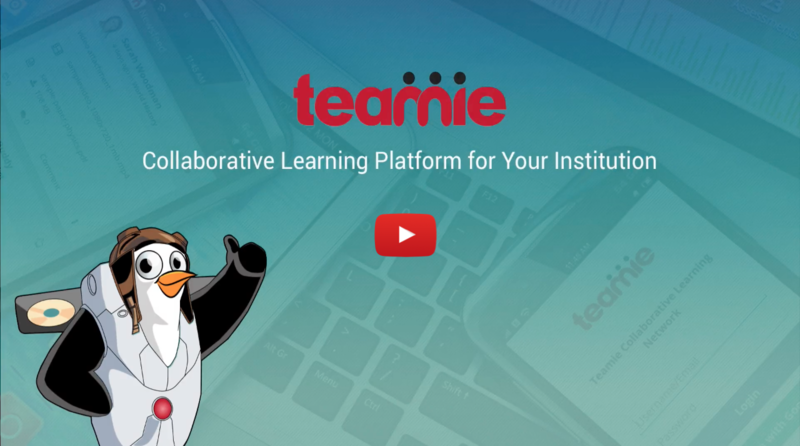 Please enjoy Teamie’s newest video that highlights some of the cool features that we have in our social learning platform. While we don’t expect it to win any academy awards or break box office records, it does offer our most comprehensive virtual tour of the Teamie LMS to date. So sit back, relax and enjoy the ride! This blog post will provide an explanatory transcript of the features, capabilities and components explored in the virtual tour. We begin on the custom branded login page. Every Teamie customer gets a custom branded login page and custom branded site (with school colors and logo featured throughout the interface) hosted on our or customer’s own domain. A successful login takes the user (teacher in this case) onto a landing page where modules, that the user belongs to, are displayed. Simply choose one and enter a private learning area, classroom or social group. We now proceed into the History classroom. Social and collaborative learning is centerstage on the classroom newsfeed area where questions, tasks, and thoughts can be posted. Peer to peer interaction, sharing of resources and learning through multimedia rich resources happens in this space and lends to engaging and empowering learners. You’ll note, popping in occasionally during the tour, various features which act to provide feedback on learning progress or to pull learners along by informing them of pressing or upcoming tasks and assignments. The idea is that learners are eased and guided along their learning journey, Teamie is consistently providing useful signposts so that the learner never gets lost or stuck. We next proceed into the materials section where content creation is made easy with Teamie’s simple drag and drop interface. Make your lessons, quizzes and assignments adaptable to students’ different learning dispositions and multiple intelligences, by utilizing an array of multimedia resources which Teamie lessons support. Rich feedback, learner data and analytics are provided through quiz results, assignment rubrics and gradebooks (both basic and standards-based). These components ensure that students, teachers, parents and administrators are aware of where learners are at with their understanding and mastery of curricular concepts and objectives. Finally welcome to the native mobiles apps for Android and iOS. 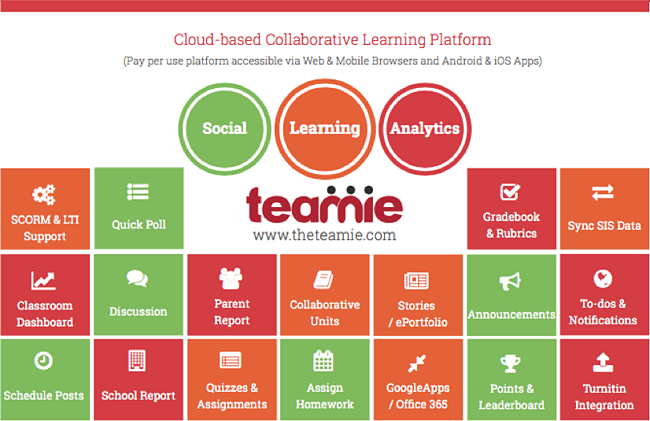 Teamie mobile apps allow for learning to extend beyond the walls of the classroom and for learning to happen anywhere anytime. Take real time videos or photos on your phone and post to the classroom newsfeed, this capability allows for real world connections of learning to be made, expressed and shared by students easily, instantaneously and regularly. Hence, you can safely say that Teamie incorporates all the features of a LMS that are necessary in the modern world of education. We hope you enjoyed our Teamie virtual tour, please come back and visit again soon! For a more extended tour or demo of our platform, please contact us at contactus@theteamie.com and we will be happy to set one up for you. Planning to roll out Learning Technologies to enhance learning pedagogy? Download this white paper that includes 24 Best Practices for implementing an LMS.